FAST SHIPPING--Items ordered by noon EST will normally ship THE SAME DAY. Orders after noon will ship THE NEXT DAY. Health And Beauty Matters is an authorized seller of Native Remedies products. Don’t weight to beat the bulge! Many people are unhappy with about their body type and weight, and embark on a journey to shape up. Unfortunately, this often leads to a series of fad diets in order to slim down. While yo-yo dieting may be effective in the short term, in the long run, regular fluctuations in weight can disturb the balance of the body’s metabolism – leading to systemic confusion and a sluggish metabolism, gradually making the task of getting healthy and slimming down increasingly difficult. This slower metabolism can eventually lead to weight gain, even when eating normally. Some people follow unhealthy weight loss plans such as crash diets, and prescription or over-the-counter medicine to control their appetite. Though many of these products advertise themselves as healthy weight loss supplements, some contain harmful stimulants that raise heart rate and speed up the metabolism in an un-natural way. Even some so-called natural products for weight management contain ephedra and other harmful stimulants that can have negative effects on the body. Ultimately, the regimenting is unrealistic and the weight lost often returns with a vengeance after the diet or product is stopped. Healthy weight loss plans that support natural and healthy weight management agree that the most crucial factors are following a healthy diet, exercising a minimum of three times a week, and drinking the equivalent of eight glasses of water a day. Other healthy body slimming tips are incorporating relaxation techniques into your daily routine to better deal with stress. It is well known that our body reacts to stress by releasing cortisol, which makes us store fat around the waist and abdominal area. Natural remedies offer weight loss supplements that have been used in traditional medicine for thousands of years to support the healthy functioning of digestion, the metabolism, liver functioning and the healthy breakdown of dietary fat, helping to promote a balanced weight and body type. In more recent times, research has confirmed this traditional wisdom. There are now many published clinical studies demonstrating the ability of a range of herbs to support the normal functioning of the liver, stomach and digestive system and promote a healthy metabolism. For instance, hydroxycitric acid (HCA), a derivative of citric acid, is found primarily in a small, sweet, purple fruit called Garcinia cambogia. In an 8-week, double-blind, placebo-controlled trial of 60 overweight individuals, use of HCA produced significant weight loss as compared to the placebo. (Thom E. Hydroxycitrate (HCA) in the treatment of obesity. Int J Obes Relat Metab Disord.1996;20(suppl 4):75). Each remedy has been formulated to address a specific body function or symptom, and works on its own. However, combining remedies provides a complete solution and is not only safe but highly recommended to achieve the best possible result. Our herbal remedies are often paired with our homeopathic products or homeopathic tissue salts to provide complete solutions for healthy weight loss and metabolism. EcoSlim is a 100% safe, non-addictive natural herbal remedy formulated for adults by our team of natural health experts. EcoSlim can especially benefit those individuals needing to consistently support routine weight management and a health metabolism without compromising health or serious side effects. EcoSlim is effectively used as part of a total slimming program to safely support healthy metabolism, energy levels and systemic balance in the stomach and digestive system, without harmful side effects and without stimulants. In combination with a healthy lifestyle and balanced diet, EcoSlim supports the healthy functioning of the digestive system, thereby helping to maintain optimum performance. Vital organs in the body that are instrumental in regulating weight, metabolism and energy expenditure need systemic balance to function properly. How has EcoSlim helped others? Discaimer: Testimonials may have been edited to comply with FDA regulations. While positive results are likely, the testimonials used are general results and are not intended to represent or guarantee that anyone will achieve the same or similar results. Native Remedies' products are created using a set of standards and processes that combines the best quality, laboratory-tested, raw ingredients, good manufacturing practices and a Full Spectrum manufacturing method to guarantee you products of the highest quality, safety and effectiveness. Bladderwrack (Fucus vesiculosis) is a sea vegetable and a concentrated source of minerals, including iodine, potassium, magnesium, calcium, and iron. As it is a source of iodine, it assists in the production of thyroid hormones, which are necessary for maintaining healthy metabolism in all cells of the body. Fucus Vesiculosis is also known to support glandular health, especially in the pituitary and adrenal glands, while maintaining healthy blood circulation. Other known actions include the maintenance of healthy digestion and intestinal functions. Furthermore, recent studies suggest bladderwrack may be beneficial in supporting healthy thyroid response as well as energy and vitality levels. Gaigi S, Elati J, Ben Osman A, Beji C (Experimental study of the effects of seaweed in the treatment of obesity) (Article in French). Tunis Med 1996; 74: 241-243). Malabar tamarind (Garcinia cambogia) is used to naturally balance the appetite. The active ingredient of Garcinia Cambogia is hydroxycitric acid (HCA). Hydroxycitric acid is a fruit extract similar to citric acid from oranges and grapefruit, derived mainly from a small, pumpkin-shaped fruit, the Malabar tamarind. Hydroxycitric acid is a natural substance found in the fruit. Research indicates that HCA supports balance in appetite, inhibits lipogenesis (fat storage) and, lowers the production of glycogen in the liver. Recent studies have found Garcinia Cambodia to be beneficial in supporting weight-loss efforts. (Heymsfield SB, Allison DB, Vasselli JR, et al. Garcinia cambogia (hydroxycitric acid) as a potential antiobesity agent: a randomised controlled trial. JAMA 1998; 280: 1596-1600.) (Rothacker DQ, Waitman BE. Effectiveness of a Garcinia cambogia and natural caffeine combination in weight loss: a double-blind placebo-controlled pilot study [abstract]. Int J Obes 1997; 21 Suppl 2: 53). Dandelion (Taraxacum officinalis) contains bitter principles that have a tonic effect on the liver and digestive system. It is also a very rich source of vitamins and minerals, including Vitamins A, D, C, and B and iron, silicon, magnesium, zinc and manganese. In more recent studies, Taraxacum officinalis was shown to have a positive effect on weight management. (Racz-Kotilla E, Racz G, Solomon A. The action of Taraxacum officinale extracts on the body weight and diuresis of laboratory animals. Planta Med 1974;26(3):212-217). Licorice (Glycorrhiza glabra) has many uses, including being a general tonic for the digestive system. A recent human study found that a preparation of licorice may assist in healthy weight loss efforts. Fifteen normal-weight subjects consumed licorice for 2 months (3.5 g a day). Body fat mass was measured before and after treatment. Licorice was able to reduce body fat mass. (Bernardi M, D'Intino PE, Trevisani F, et al. Effects of prolonged ingestion of graded doses of licorice by healthy volunteers. Life Sci . 1994;55(11):863-872). Another study found that a topical preparation of glycyrrhetinic acid (a component of licorice) was able to reduce the thickness of fat on the thigh in human subjects. (Teelucksingh S, Mackie ADR, Burt D, et al. Potentiation of hydrocortisone activity in skin by glycyrrhetinic acid. Lancet . 1990;335:1060–1063). Centaury (Erythrea centaurium) is regarded as a natural liver tonic. This herb is also an excellent blood cleanser and general tonic. Guarana (Paulina cupana) is a climbing shrub that grows wild in the Amazon regions of Brazil and Paraguay. This supplement is derived from the seeds of Paullinia cupana and regarded as a nervine tonic, beneficial in supporting energy levels. Guarana also has tonic properties that can help the intestines and support healthy digestion. An herbal preparation from South America containing guarana extract demonstrated an effect on perceived gastric fullness and supported weight loss over 45 days in a double-blind placebo-controlled parallel trial (Anderson, T and Foght, J (2001). "Weight loss and delayed gastric emptying following a South American herbal preparation in overweight patients". J Hum Nutr Diet 14 (3): 243). Tumeric (Curcuma longa) has been shown to support the production of natural cortisone by the adrenal glands. (Arora RB, Basu N, Kapoor V, Jain AP. Anti-inflammatory studies on Curcuma longa (turmeric). Ind J Med Res 1971;59:1289–95). Studies have also shown curcumin to protect the liver from a number of toxic compounds. (Kiso Y, Suzuki Y, Watanbe N, et al. Antihepatotoxic principles of Curcuma longa rhizomes. Planta Med 1983;49:185–7). The liver is also instrumental in supporting the flow of bile, which is responsible for the breakdown of dietary fat. Ginger (Zingiber officinalis) has been shown by recent studies to be beneficial in calming the stomach and supporting digestion, as well as preventing nausea. (Bryer, E. A literature review of the effectiveness of ginger in alleviating mild-to-moderate nausea and vomiting of pregnancy. J Midwifery Women’s Health 2005;50(1):e1-e3). Cayenne pepper (Capsicum minimum) has been traditionally used in herbal medicine as a general circulatory tonic and digestive aid, helping to naturally support the production of gastric juices – a key factor in healthy metabolism. Capsicum is a sialogogue (an agent that supports the healthy flow of saliva) thus aiding the benefits of saliva in the digestive process. How do I use EcoSlim? Safety during pregnancy and breastfeeding has not yet been established. If you are pregnant or nursing, our Triple Complex Slimmer's Assist can quite safely be taken for effective promotion of healthy metabolism and weight management. As with many effective herbal treatments, EcoSlim begins to work on the body systems almost immediately to support you in your weight management efforts. 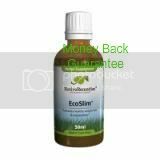 EcoSlim comes in a concentrated tincture formula that facilitates rapid absorption into the blood stream. This means that the healthy functioning of the digestive system and routine metabolism is instantly supported. Individual slimming response times will vary, however, and depend on constitutional makeup, diet, activity levels and exercise programs. One 60 ml bottle of EcoSlim will last approximately 30 days depending on usage.